There are several points to cover when it comes to proper usage of a purificator. I'll start with the Extraordinary Ministers of Holy Communion (note the "extraordinary" part. They're NOT SUPPOSE to be a part of everyday, or even every Sunday, liturgy). There has been such a poor teaching correlation between what people are suppose to learn in Sunday school and how that transcribes to proper implication of said beliefs during the Holy Mass that to go through all the topics would be the end of my blog. I would have nothing more to say! But alas, I'll try to stay on topic. To properly use a purificator (that is, if Holy Communion is being distributed in both kinds. More on that later...), the ExMHC must fold the purificator over the "pointer" of the left hand with the middle finger on the outside as a resting place for the purificator. The thumb, when purificator is not being used, must be on the outside of the purificator. When the purificator is being use, the thumb goes under the cloth where the point finger is and uses the two fingers in a pinching fashion that directly wipes the Blood of Christ in the exact same place very time. A properly used purificator should not look like you used it to stop a nose by bleeding everywhere (sorry for the poor mental image) but as if you merely pricked a finger and were holding a cloth in the same position while you waited for the blood to clog. You must use as little area space of the purificator as possible! You do not wish to be ideally touching the Blood of Christ only to then scratch your nose, wipe your hand against your pants, or any other form of touching that would then leave Christ's Blood on something! If you are to administer the sacred chalice at Holy Mass, you MUST, under all circumstances, pay the UTMOST attention to how you use the purificator and what the Precious Blood touches. No exceptions! To do anything other than that in full knowledge would damage your soul and you would be in need of a Sacramental Confession (sorry for not using "reconciliation". I guess the word "confession" is too pre-conciliar.)! Priests...don't think you're out of the clear on this topic. Everything I've just said applies to you. I'm not being pretentious. I care for all immortal souls. You too must pay strict attention to how you use the purificator, where you place the purificator after using it (make sure the Precious Blood isn't touching the corporal directly), and how you cleanse the sacred vessels after administering Holy Communion. When cleansing the sacred vessels, you must fold (without your hands touching the Precious Blood, of course) the purificator in such a way as to be able to cleanse the sacred vessels without putting the Precious Blood back onto the sacred vessels. If you do not think of how you are using the purificator, you could, and probably are, very well be counteracting your very purpose of trying to purify the sacred vessels. Now some of you priests might be thinking, "Well Chase, the sacred vessels will always have microscopic particles of Christ's Body and Blood in it's pores. Why be so 'nit-picky' about it?" The very idea that a priest would ever ask that question should be a vital sign for the priest to reconsider and reassess what he truly believes is the Most Holy Eucharist. You are touching THE ALMIGHTY ONE! By carelessly using the purificators like a napkin at your local Denny's on the sacred vessels that are use to transport CHRIST HIMSELF is sacrilege. Be AWARE! Re-train all your ExMHC's! Make sure everyone KNOWS! It could mean the very difference between receiving Our Lord in the state of grace or the state of mortal sin! Most of you who read this will probably think I'm some kind of crazy, closeted sedevacantist who just wants to make the Catholic Church back to the way it was prior to Vatican II. I'll admit - there are many aspects of the Catholic Church prior to Vatican II that I truly desire for the Church today. For one, it's consistency in all liturgical actions in how we, as a Church, truly believe, think, and pray. If we are being authentically Catholic in everything we do, I'm sure the Church Militant will find a way to correct itself. It's already happening. You're probably asking to yourself by now, "Why does the title also say something about the Shroud of Turin. None of this had anything to do with that." You're wrong. The Shroud of Turin has everything to do with this. 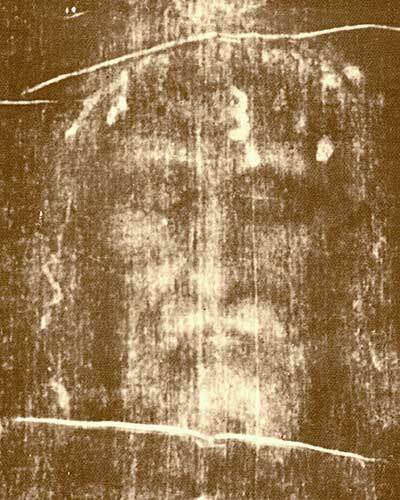 The Shroud of Turin was the burial cloth by which Our Lord was wrapped in within the tomb. This burial cloth touch the Precious Body of Christ! The cloth has stained on it the Precious Blood of Christ. Let me ask you this. How would you treat the Shroud of Turin? As the most important relic of Christian civilization that touched the Crucified and Resurrected Christ on it? Or a napkin from Denny's? Pray. Discern. And most of all, love Our Lord! There is, however, a method of using the purificator that will never touch the Precious Body or Blood of Christ. I'll save that topic for another day.